A city steeped in tradition and history, Aberdeen is a must visit destination for lovers of times past and those interested by local and national history. Through its listed buildings, expansive museums and art galleries, the identity of the Granite City really comes alive, telling the stories of over 8000 years worth of life, death and discovery. A city believed to have been inhabited in some shape or form for over 8000 years, with the city’s first charter signed in the 12th century. Aberdeen is proud of its history and heritage, particularly with regards to the shipping, fishing and granite mining industries, the three combined heralded significant growth and prosperity in the late 19th and early 20th century. The Aberdeen Maritime Museum is the most popular museum in the city, proudly showcasing all manner of exhibitions and artefacts. Located inside the historical home of 18th century Lord Provost Ross as well as other old buildings on Shiprow, Aberdeen Maritime Museum has won many awards, including Scottish Museum of the Year and the Best Building at the Scottish Architectural Awards upon it’s re-opening in 1997. Visitors get to learn all about Aberdeen’s storied maritime past, from its beginnings as a fishing village to its modern association with North Sea oil excavation. Aberdeen Maritime Museum is a 5-minute drive from the heart of town. Aberdeen’s greatest architectural feat, the Marchisal College, used to house the Marchisal Museum, a collection of fine art, and local historical artefacts. Since the building is now in use by the City Council, the University of Aberdeen has rehomed part of this expansive collection in the King’s Museum in Old Aberdeen. The University’s collection is regarded as one of the largest and most important in Scotland and is popular with students and tourists alike. King’s Museum is a 10-minute drive from Aberdeen City Centre. 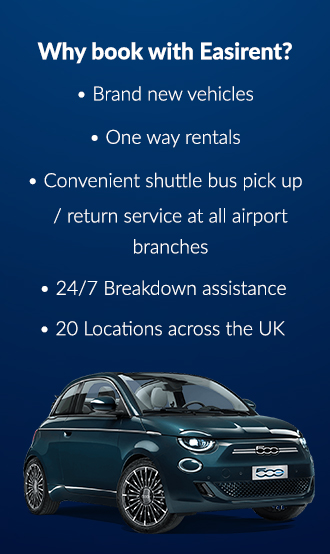 With a full range of hire vehicles at our Easirent Aberdeen Airport branch – why not explore all of what Aberdeen has to offer with a great deal from Easirent. Our short term rental rates are perfectly priced for holiday travellers. There’s also the Tolbooth and the Gordon Highlanders Museum. The Tolbooth is one of the city’s oldest buildings, and is one of the best preserved 17th century ‘gaols’ (or jails to you and me) in all of Scotland. The Tolbooth is very small and is not recommended for those with mobility difficulties, but can be found in the heart of Aberdeen on castle Street, near to the Mercat Cross. The Gordon Highlanders Museum is one for those with a keen interest in war and the armed forces. Celebrating the Gordon Highlanders who were active from 1794 to 1994, the museum houses all manner of uniforms, medals and old weaponry, and its grounds once belonged to artist Sir George Reid. The Gordon highlanders Museum is a 10-minute drive South-West of Aberdeen City Centre. Aberdeen is host to a wealth of public and private art galleries, each housing all manner of classical and contemporary art. The biggest and most popular of Aberdeen’s galleries is the unsurprisingly named Aberdeen Art Gallery. A fixture in the city since 1884, the building itself designed by noted Scottish architect Alexander Marshall who later went on to design the luxurious Waldorf Hotel in London. Aberdeen Art Gallery is home to a fine collection of modern Scottish and international art, as well as a permanent collection featuring 18th and 20th century works. Here you can see classics by Monet and Renoir, alongside modern art pieces from the likes of Francis Bacon, Damien Hirst and Gilbert and George. Aberdeen Art Gallery has also held various exhibitions around the work of Aberdeen’s own George Jamesone, considered Scotland’s first majorly renowned artist due to his portraits of royalty and high society in the early to mid 1600s. Aberdeen Art gallery is a 10-minute drive from the heart of the city. If you prefer contemporary art, then a trip to Peacock Visual Arts is in order. Part school, part gallery, part shop, Peacock works with established and emerging artists to produce and house all manner of artwork, from high quality prints to video installations and performance art. Peacock Visual Arts has been supporting Scottish and international art since 1974, and is located in the very centre of Aberdeen, near to St. Andrew’s cathedral. If you are in Aberdeen in June, then try to squeeze in a visit to the prestigious Gray’s School of Art. One of the top 20 art schools in the United Kingdom, Gray’s hosts its annual degree show in June, showcasing the best of their students, and the artists of tomorrow. Gray’s School of Art is a 20/25-minute drive South-West of the City Centre. Although it is the Granite City, Aberdeen also has a range of wonderful parks and points of natural beauty both in and around the city. Arguably the most popular green space in the whole city is Duthie Park. Opened to the public in 1883, Duthie Park is named after Elizabeth Duthie, who donated the land to the city in 18880. Today, Duthie Park offers visitors over 40 acres of wonderful greenery to explore and relax in, with play areas available for kids of all ages. Duthie Park is also home to the David Welch Winter Gardens inside a wonderful glass building which contains a year round collection of wonderful and rare plants and specimens, as well as the UK’s largest collection of cacti. Duthie Park sits on the banks of the River Dee, a 12-minute drive South of Aberdeen City Centre. Just outside of Aberdeen you’ll find Hazlehead Park, a massive public green space surrounded my football pitches and golf courses. The park itself is made up of various wooded areas, children’s play areas, and lush greenery, perfect for adventuring and playing alike. Hazlehead Park also contains a plethora of sculptures by local artists and a pet’s corner that allows interaction with a host of animals. Hazlehead Park is a 15-minute drive West of Aberdeen. Balmedie Beach is Aberdeen’s best beach, boasting miles of clean beachfront space and rolling sand dunes. It is not uncommon to see seals from the beach, but please enjoy them from a distance and try not to disturb the local wildlife. Seals aside, Balmedie Beach is also a local surfing hotspot but be prepared to shiver if you take your board out! Balmedie beach is a 20/25-minute drive North of Aberdeen. Animal lovers will not want to pass-up a chance to visit Doonies Farm, a 15-minute drive South East of the City Centre. Although still operated as a working farm, Doonies is open to the public and is home to one of Scotland’s largest collections of rare and endangered animal breeds, with over 23 rare breeds found on the farm. Peak time to go is during the spring, where visitors can see all manner of new-born lambs, calves, chicks and foals. Aberdeen and architecture go hand in hand, with the aforementioned Granite City called so because of its plethora of eye catching granite structures, designed and made using local resources. Aberdeen has also seen its fair share of important architects call the city home, from Archibald Simpson in the 18th and 19th century, to former Lord Provost James Matthews and Alexander Marshall McKenzie, the latter famously designed the Astoria Hotel in London amongst other works. Of all the historical buildings in Aberdeen, the two oldest – and two of the most popular attractions – are the houses of Provost Skene and Provost Ross. The Provost was a title bestowed on those who were elected as the figurehead of a city, a bit like a Mayor. The houses of Skene and Ross have been standing in the city since the mid 1500s, and have now been converted to local museums, with Provost Skene’s house decorated and fitted with items and art of bygone eras, encompassing the 17th, 18th and 19th centuries. Provost Skene’s house is in the heart of Aberdeen, next to Marks and Spencer, whereas Provost Ross’ house houses the Aberdeen Maritime Museum. Marsichal College is another breath-taking bit of architecture which should not be missed. The second largest granite building in the World (behind the Royal Site of San Lorenzo de El Escorial in Madrid) and is the best example of Aberdeen’s mining heritage. It is estimated that up to 50% of Aberdeen’s buildings contain granite mined from Rubislaw Quarry, when in the 19th century the city was dubbed the granite capital of the World. Marsichal College itself is in the heart of the City Centre, near Bon Accord & St. Nicholas shopping centre, and has been the home of the Aberdeen City Council since 2011.